These concepts/idea's/analyses/... are condensed and projected into heavy extremely busy and filled to the maximum images that look like alchemical drawings with influences from 60ies underground poster- & music album art, as seen through the the world of the occult, the supernatural, conspiracies or just plain bizarre views on modern (post WWII) world history, with some exceptions that go a bit furted back into time . 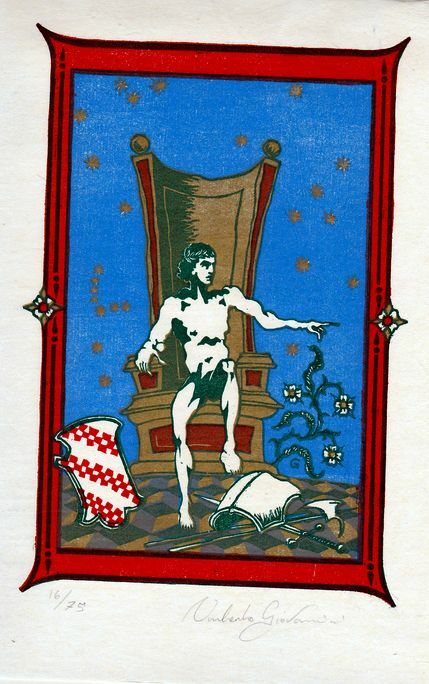 Personally I cant see it as a Tarot deck, or at least what conventionally and traditionally is seen as one, for me it's an art project under the form of a social/trans-social/analysis/visualisation (insert far-out-word-here) something that is titled tarot.It has 78 cards divided into 22 majors 4 suits 4 court cards so yes the basic structure is there but the links and correlations to what they mean are gone and replaced by the artist personal world-view. 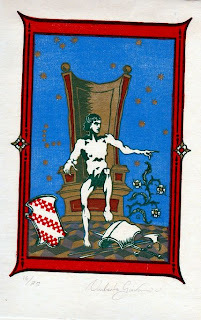 But then any deck containing Aldous Huxley as The Fool, Cybernetics as The Wheel of Fortune, Nikola Tasla as the King of wands and Hackers as 6 of Wands is bound to at least be worthy of some attention and curiosity. All the works are also published in the HEXEN 2.0 book and HEXEN2.0 Tarot both by Black Dog Publishing. Ah love, no one can live without it, merely survive and it inspires us to create great works of art. This deck is not only inspired by the artist for his beloved muse but has love as a theme.A true work of art and testimonial to Love. The decks title roughly translates to 'Tarot of love the sacred and the profane', from the highest to the most corporeal, all aspects are linked to the 78 cards in the tarot and this in a style that combines both aspects, all at the same time dreamy elegant and earthly sensitive. 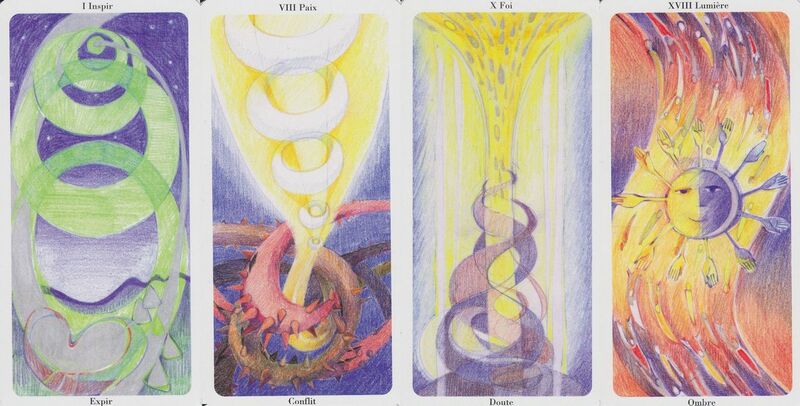 The artist also linked each card and image to parts of songs or literary excepts to evoke the correct mood and kind of love best fitting each arcana. 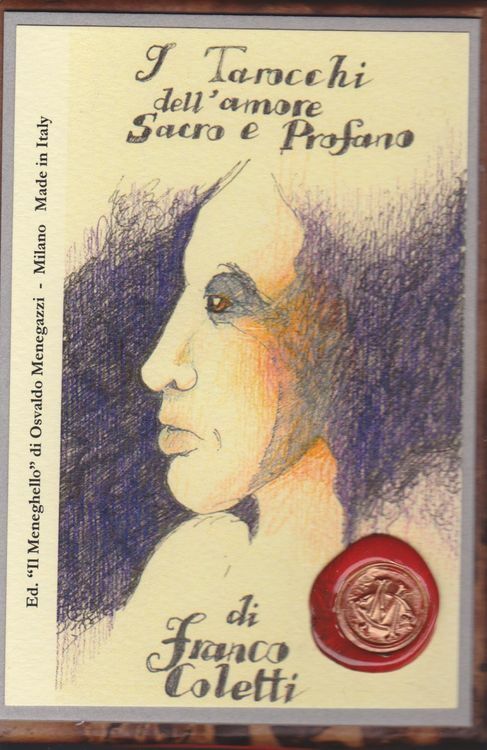 This wonderful tarot comes in a very very limited edition of only 12decks, you can check the availability and order directly from Ill Meneghello by email. India is one of those countries that despite being depicted in deck or it's mythology being used in many decks has produced very little tarot decks itself, this one is only the second one I have that is produced there. 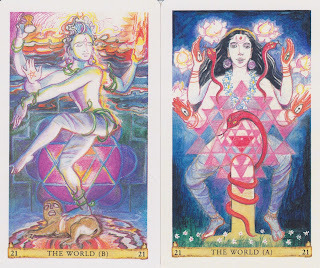 It is a 82 cards deck consisting of the classic 78 + 2 versions of both death and the world and also 2 'blessing cards' Blessings of Ganesha & Blessings of Blessings of Babaji. The style is directly identifiable as Indian, not the opulent rich golden one but the contemporary swirling vibrant version of it. The majors depict the Indian Gods & Goddesses while the minors are retelling the epic stories from the Ramayana and Mahabharata, the life of the Buddha and the love story between Shiva and Parvati, poured in a narrative form best suiting for each suit. All information you need and even more about the cards and what they stand for, their background and meaning is found in the well-written 350 pages handbook. One of my big soft-spots when it comes to tarot are decks who have been created by collage, and I recently obtained one from this Etsy shop.The tarot has a limited print run of only 125 decks so be quick to grab one if you like it too. I'd describe the style as (neo)Victorian & romantic, a multi-media project combining old images with various techniques to obtain 78 little works of art that would fit everyone with a love for decks that have a well balanced nostalgia vibe. Despite being well filled up, but in a good way, these cards do not feel heavy or overwhelming, partly thanks to it's larger than standard size, partly to the whole way they are made up. Balancing out the busy fronts of the cards, the backs have a soothing, classy red fleur-de-lys pattern. Opulent could be a perfectly fitting term to describe them. Fitting the whole theme and look the suits are named Sticks, Coins, Swords & Hearts adding to the turn of the previous century, gipsy (perhaps even a bit decadent) feeling. At the moment there is a revival it seems, of all things vintage or new with a vintage-feel, a trend that also can be felt in tarotdecks. Although the artist has put lots of efforts into the deck and into the research to link the best fitting plants to each card the whole looks elegant and airy, nothing heavy but 78 cards of elegance and nostalgia. You can get the deck from the artist's Etsy webshop or her website and yes she is also on FaceBook. Tarot's come in all kinds and sizes from the minuscule to the HUGE, this one fits in the second category, size- and prize-wise, but is was so worth it.The Italian artist printmaker Umberto Giovannini, who has a special love for the polychrome woodcut technique used this love and his mastery over it to create 22 large (20x14 cm) tarot artworks. The whole 'deck' was showcased during an art exhibition at the "Palazzo Gambalunga" in Rimini (Italy) during April 2004 and printed in an edition of 99 decks (XV in Roman Numbers for the artist, 9 with letters for libraries and contributors and 75 copies of the normal edition), beautifully displayed in precious dark green passe-partouts bordered with gold. and bound into a book encased in a green box, truly an exceptional production and work of art and craftsmanship.